The Paramour Group, and JAAB Productions, are proud to announce the 2015 XG Extreme Guitar Tour featuring members of Black Sabbath, Deep Purple, DIO, MSG, Rainbow, Trans Siberian Orchestra, Scorpions, UFO & Yngwie Malmsteen. 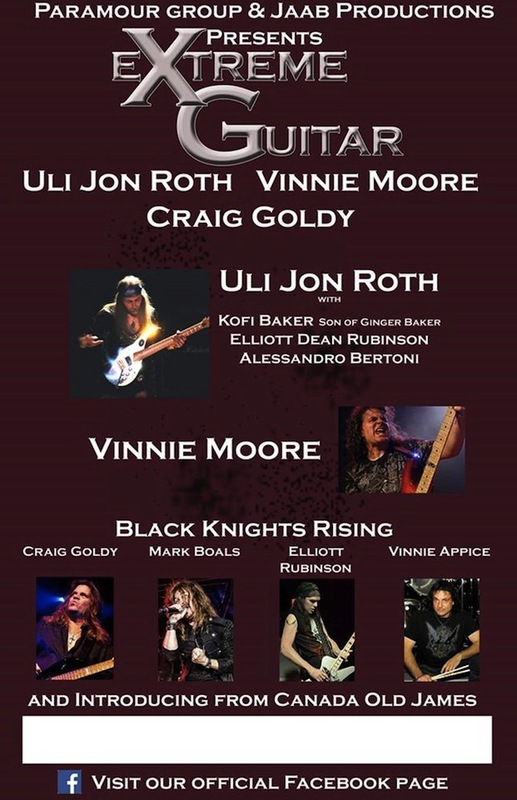 XG Tour includes performances by guitar greats Uli Jon Roth, Vinnie Moore, Craig Goldy and introducing new act, Black Knights Rising. Black Knights Rising features: Craig Goldy (guitar), Vinnie Appice (drums), Mark Boals (vocals), Allesandro Bertoni (keyboards) and Elliot Rubinson (bass). Special guests Joe Lynn Turner* (Rainbow, Deep Purple) & shredding Shrapnel Records recording artist Joey Tafolla* (Jag Panzer & solo artist) will perform at select shows. Drumming for Uli Jon Roth will be Kofi Baker, son of Cream drummer Ginger Baker. Elliot Rubinson, CEO of Dean Guitars will be featured on bass during the performances of all three guitarists. Confirmed dates listed below with more to be announced soon! Canadian rockers Old James will be special guests on all shows. Need a Boston or RI date please! On the West Coast shows, which shows will Joe Lynn Turner be on the bill?